Gagaridir is a desert world with a thin tainted atmosphere. The system supports a population of fewer than 10,000 sophonts. It is a member of Third Imperium in the Antra Subsector of Deneb Sector and in the Domain of Deneb. Gagaridir, as a member world of the Third Imperium, holds the estate of an Imperial knight, a member of the Imperial Nobility charged with overseeing the world. This world has a nearby Imperial Naval Base, capable of handling warships. Gagaridir is a poor, barren, desert hellworld with no overt population, government, or law level. Non-canon: Gagaradir is the fifth of eleven moons orbiting the sole world in this sparse solar system, a large "Warm Jupiter" known as Aalimik. The moons are metal rich, and Gagaradir has especially plentiful bodies of heavy metals required in starship manufacturing. Scouts from the Third Imperium had initially done only a cursory survey of the system, and for most of its history the world only attracted a small population of independent prospectors that kept the secret of its mineral riches from Imperial and Vargr assayers, usually by selling it to various small-time independent brokers across Antra and Million Subsector. Another survey in 1082 showed the extent of this wealth, and a fight brewed among rival claimants. The belters played off their megacorporation suitors for about a decade, until Makhidkarun beat out Ling-Standard Products in a bidding war. The Vilani quickly expanded the belters' haphazard operations, creating a massive strip mining operation that scoured the entire surface with giant mining platforms. These would dig a meter or more into a subsurface mineral body, slowly wearing down a pit by excavating the ores. These would be crushed down to gravel sized bits, and poured off conveyors into huge open bed dump trucks, who would carry the slurry off for offworld shipping. The miners were mostly equipment operators who lived at one of several rude, temporary downports near the main production areas in mobile quarters. These downports were landing zones for mine shuttles that carried the ore to the orbiting B-class starport for final departure. Makhidkarun's operations included the extraction of various vital heavy metals that were very lucrative, and various rivals disputed its claim with legal and illegal means. Makhidkarun's main enemy was LSP, who used both legal chicanery in Imperial courts and an alliance with a Vargr corsair group to try to pressure its rival into abandoning the world. The latter were based upon Tchien, and were persistent in their raids upon the company's shipping. After losing several vital freight loads, Makhidkarun hired a starmerc group that attacked the corsairs on their homeworld, driving them from the system permanently. After recovering incriminating documents on LSP's connivance in this affair, the Vilani corp enjoyed a decade and a half of peace. The assassination of Strephon put the Imperium into turmoil from which it would not recover. 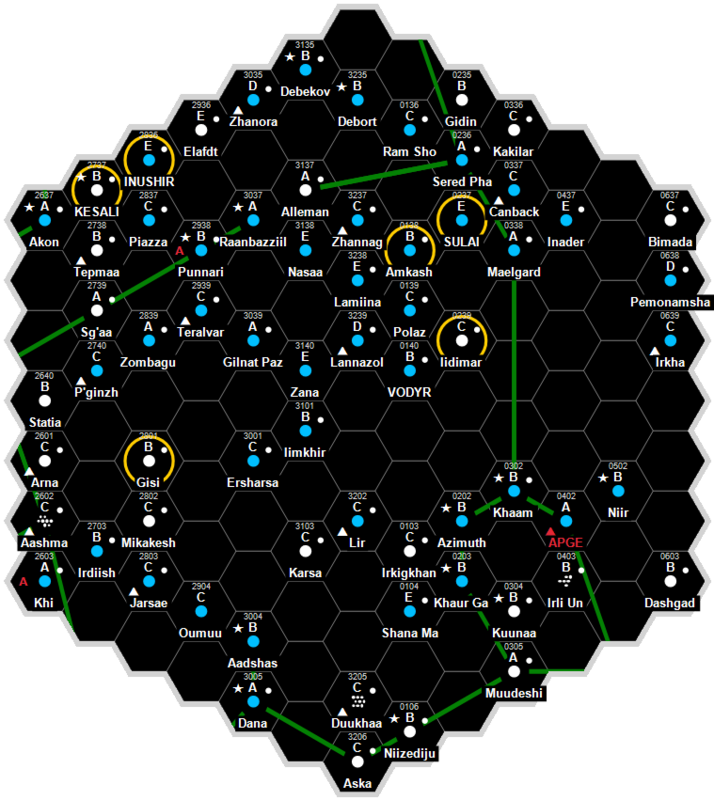 Makhidkarun faced an uphill struggle during 1116-1122, during which its operations were crippled by escalating security costs, capital flight from the Domain of Deneb, and renewed LSP sabotage. With its operations now becoming unprofitable, the company sold its stake to Sternmetal Horizons and abandoned the Domain of Deneb. Sternmetal kept the operation going (with assistance from Hortalez et Cie) in the face of LSP intransigence, but the Collapse and the Abandonment caused it to abandon the world in 1133. The orbital starport was dismantled and all personnel were evacuated without further incident. Analysts expect renewed competition between LSP and the Sternmetal bloc for this rich world when the Frontier is reopened in 1202. Gagaridir, as a member world of the Third Imperium has a member of the Imperial Nobility overseeing the world.